If you have bad credit and are trying to get approved on a mortgage to buy a house or to refinance your current mortgage than you may run into a few roadblocks. You probably understand that already but fear not. There is still a chance you can get approved. I’ll do my best to explain how it can be done. Mortgage companies have two kinds of loans. A desktop underwritten loan and a manually underwritten loan. Both are similar in their guidelines but one has more restrictions than the other. Desktop Underwritten (DU) – A system connected to Fannie Mae that would approve or deny your application based on your mortgage application factors such as income, assets, loan to value, and credit score. Each of those factors had a strength value that would be put into consideration when doing your loan. Your application is sent and returned through the system and an approval or denial is determined in less than a minute. If there was a denial it would say why. In turn it would tell the mortgage banker what they need to tell the client to do for an approval. Your best hope on getting approved with bad credit scores lies with a desktop underwritten loan. And the best qualifying factor you can have is equity in the home. Many people think having great credit is the most important factor in getting approved on a mortgage and they are wrong. Its important but not as important as equity (low Loan To Value). I have seen people with a 585 credit score, collections, credit card debts, and a late mortgage payment get approved on a refinance. Reason being is even after paying the collections and credit cards off they still had 35% equity in the home. The system determined they were worth lending to even with bad credit scores because if things got tight for the borrowers they would probably sell the house as they had equity or if it went into foreclosure there was enough equity to cover the mortgage. Same thing with buying a home. If you can put down a lot of money (10% to 20%) then you’ll have a better chance of getting approved if you have bad credit. Manually Underwritten – This is a loan not backed by Fannie Mae but by investors such as hedge funds and pensions. These loans are tailored for each investor. For a loan to get an approval it has to meet all guidelines, not just a couple. Basically, the mortgage company or bank makes up their own rules without the insurance backing of Fannie Mae. You had to have 720 credit scores, no cash-out, rate/term refinance, no mortgage lates in a year, debt to income ratio below 45%, 6 months worth of assets in accounts, been working for two years straight in the same profession, etc. If the borrower met all these guidelines than they would get approved. Unfortunately for people with bad credit scores there was little chance of an approval. The lowest credit score I saw available was 620 with a lot of equity in the house. Many of the manually underwritten loans went away after the housing collapse as there was too much risk. All that really remains for manually underwritten loans is Jumbo Loans (very high loan amounts). 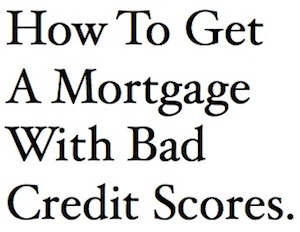 It is possible to get approved on a mortgage with bad credit scores. Assuming you make enough money to cover the mortgage payment the number one factor in getting approved is if you have equity in the home. I saw it quite a bit when I was a mortgage banker especially when people were trying to refinance. Things happened after they bought the house which ruined their credit scores. What I saw in those situations was their credit scores went down because of collections, credit card debts, liens, judgements, etc., and after we consolidated those into the new mortgage their credit scores jumped up 100 points four months later. Again, because they had equity in the house. Buying a home with bad credit was few and far between. Rarely did anyone with under 680 credit scores try to buy a house with 10% or more down. They were all trying to buy with nothing down. And as I stated above, the system does not like that. In most situations it would make sense for them to clean up their credit scores first. You have figured out by now that getting approved for a refinance with bad credit scores and some equity in the house is going to be easier than buying a house. And it’s because the mortgage company knows that at some point you probably did have good enough credit to get into the house. If you do not have equity and have bad credit scores than it is going to be tough. I would say go with an FHA loan if your credit is borderline. It’s becoming one of the most popular mortgages and may offer lower closing costs. Plus you’ll be getting a secure 30 year fixed too. You’re usually required to put about 3% down though. Also don’t try to buy a “fixer upper” on an FHA loan. “The man” won’t allow it to pass an inspection if there’s a hole in the roof or it’s been ransacked because it was abondoned. Some realtors think that an FHA loan is a garbage loan because most sellers don’t take FHA buyers seriously and FHA can be more work on the realtors part……don’t worry, realtors will close anything they can these days, they’re starving. If you need a realtor because yours won’t work for you, go to this website and I’ll set you up with a better one for free.